How shaped are we by our middle school days? Do our experiences there decide how we live the rest of our lives? Are our memories of this period fond, or continue to haunt us? Can one ever let go of those experiences? The King Of Pigs, a harrowing and violent Korean animated drama written and directed by Yeun Sang-ho, impressively delves into these questions. The King of Pigs won three awards at the Busan International Film Festival and was selected to screen in the Director's Fortnight at the 2012 Cannes Film Festival. It makes its Australian premiere at the Sydney Film Festival in the Official Competition. 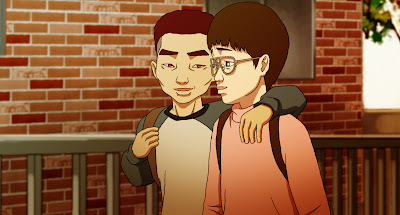 The narrative follows two young men and former school friends, Kyung-Min (voiced by Oh Jung-Se) and Jong-Suk (Yang Ik-June), who meet for the first time in 15 years - each facing their own individual adult problems - and reflect on their middle school days and the kid who changed their life forever. The film jumps between their present day conversation, and flashbacks to the incidents they discuss. Kyung-Min, who we are introduced to standing in the shower, is distraught at his company's recent demise and the death of his wife, slumped over the kitchen table. It is assumed, but never revealed, that he has killed her. He makes a phone call to Jong-Suk, now a journalist and struggling novelist, who in a fit of jealousy beats up his wife before leaving the house and meeting Kyung-Min. There are lots of incidents conveyed to the audience. 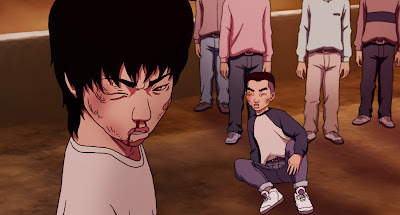 Both Kyung-Min and Jong-Suk suffered repeated humiliation at the hands of the school's ruling class (wealthier and smarter students referred to as dogs) - a clan of bullies who were allowed by their teachers to keep the rest of the students (the pigs) in check. These methods involve horrific acts of public humiliation and bullying, and unprovoked violence. It is angering to watch this unchecked schoolroom hierarchy reach the extremes that it does. One interesting case is the arrival of a new student - bright and talented, and friendly to everyone - who draws attention and is declared the 'best essay writer', angering the leader of the pigs, who enlists him to be punished and taught the new rules. 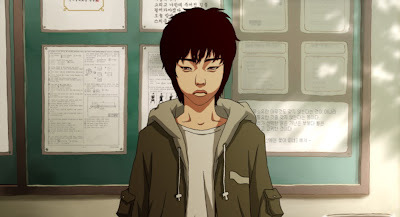 The pair meet a diner and discuss Chul (voiced by Kim Hye-na), the one boy who stood up to the dog's brutality, befriending the pair and proclaiming that the only way to overthrow the dog's influence was to match their brutality with reciprocated evil. The stronger-willed Jong-suk is onboard, but the meek and sensitive Kyung-min is not so sure. Ultimately, after being expelled, Chul proposes they send a message ensuring that their tormentors never remember their school days with any semblance of joy or happiness. It is the completion of this act, and Kyung-min's knowledge of what really happened that day, which resulted in their separation for the last fifteen years, and the reason why he has suddenly called his friend to discuss the past and accompany him to their old school. One of the main criticisms I had with the film, and this is not the fault of the filmmaking at all, but of the screened print itself. The subtitle translation was very poor and often distracting. A lot of the subtitled dialogue did not form coherent sentences, which meant extra work to decipher the meaning. I found the cycle of brutality also became a bit too monotonous in the middle. There seemed like an uncomfortable amount of similarly staged sequences in the classroom. But, in defence of this, it is the relayed memories of the two men. They would have only remembered the essential details; what happened to them, Chul's involvement, and how their friendship with Chul spawned the ideas that would forever change their life. They weren't concerned with conveying what the rest of their classmates (who are depicted just sitting around and watching most of the time) were doing. It is an uncomfortable film to watch, and quite unlike any animated feature I have seen to date. The violence is raw and impacting, there are a couple of very grisly scenes and some surreal hallucinations. Also, because there is a lot of emotion, the characters are often crying and screaming, which makes the experience less than pleasant. 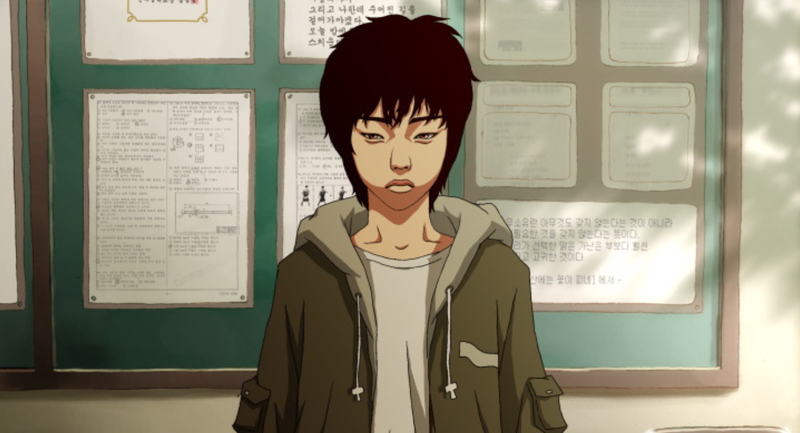 But the film's cultural significance, highlighting the horrendous conditions for underprivileged and lower class South Korean students, as well as the power it holds in regards to the two friend still unable to forget what happened, has continued to grow on me. The film's modest budget - only $150, 000US - is impressive considering some of the excellent animation, which is highly cinematic and conveys some stylised examples of brutal violence. The film's startling twist - a very clever reveal - and the rousing final act, really redeems the film after the somewhat repetitive middle, despite a consistently strong narrative drive when balancing the two time periods. Sure to be one of the better animated films I watch in 2012.